In this first paragraph, you have to pinpoint the uniqueness of the product you are describing - quality, flawless processing, a good price, etc. It is appropriate to reach an interesting form that will attract the customer - eg Do you want to fulfill dreams by acquiring modern 3D TV? Are you looking for an upgrading to your home that will make your everyday life easier? At the same time, however, it is not appropriate to repeat the product name (which is just above this paragraph). The range is sufficient for a maximum of 6 lines. In this section, it is good to devote some interesting features that are different from competing or similar products. Each manufacturer has its own technology and different dates for product functionality - to break down their benefits, pros and cons. The product description must be positive - you can always find some good properties. Negative things certainly not to mention, not to emphasize shortcomings and imperfections. It is necessary to observe extensive sentences and useless exclamation point unnecessarily. Repeatedly, it is inappropriate to use the same words (is who, will, can, like). If the text is on multiple paragraphs, be careful to edit them. It's not nice if they are as long and in a similar fashion. Use bold highlighting only for an interesting phrase - up to one paragraph per paragraph. A simple wooden puzzle that will not only develop your child's hand-eye coordination but will also help them recognise letters of the alphabet. The task of the child is to place the individual pieces in the cut silhouettes on the board. The letters are multi-coloured to capture your child's attention. Children can practice their fine motor skills and develop their spatial imagination. The toy is made of high-quality, non-toxic, durable wood. This toy complies with Directive 2009/48 / EC of the European Parliament and of the Council of 18 June 2009 on the safety of toys and all statutory standards in accordance with Czech legislation. Of course, there is a CE declaration of conformity. 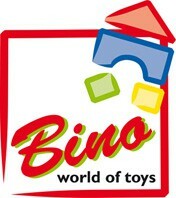 For shipping to other EU countries visit this page Bino Alphabet Puzzle. Für Versand nach Deutschland, besuchen Sie bitte Bino Puzzle - Alphabet. Chcete doručit zboží do Česka? Prohlédněte si Bino Puzzle - Abeceda. Chcete doručiť tovar na Slovensko? Prezrite si Bino Puzzle – Abeceda. Für Versand nach Österreich, besuchen Sie bitte Bino Puzzle - Alphabet. Magyarországra történő kiszállításért tekintse meg ezt a termékoldalt: Bino Puzzle - Ábécé.